This Fact Sheet provides Age and Service requirements for various Tier 3 retirement plans at a glance. The benefits and obligations of the Enhanced Disability Benefit program (EDB) available to participants in the Uniformed Correction Force 22-Year Plan (CF-22 Plan). This booklet is called a Tier 3 Summary Plan Description or SPD for short. 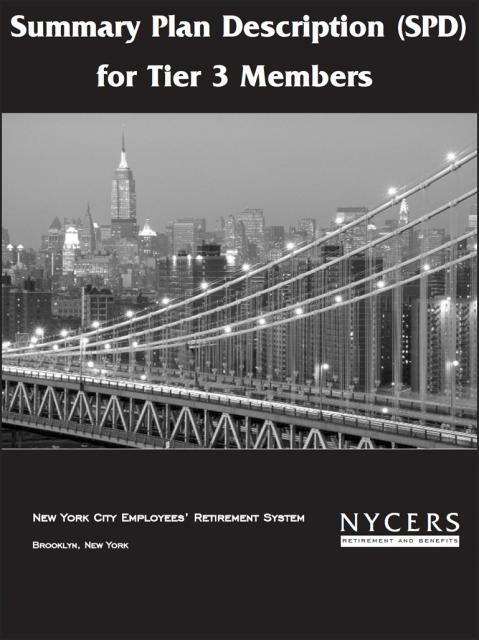 It is published by the New York City Employees’ Retirement System (NYCERS), and is intended to summarize all of the provisions relating to retirement plans, programs and other benefits offered to members who are employed in the Uniformed-Force of the New York City Department of Correction, who became members on or after July 27, 1976. Laws affecting your pension tier or plan can be enacted in any given year, which may result in possible inaccuracies within this SPD. The benefits and obligations of the Enhanced Disability Benefit program (EDB) available to participants in the Uniformed Sanitation Force 22-Year Plan (SA-22 Plan).